Quilt market was so nice and such wonderful people. One of the people we got to meet was Moda's new designers Mary Jane. She is so sweet and down to earth. She lives in Idaho and does organic farming. She is a great writer and now designs fabric. 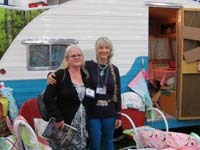 We have ordered her line which will arrive next year it is called Glamping. A combination of glamour and camping. I managed to take a few pics of her with a camper which are really great. She lives in a camper, not this small and has a bed and breakfast that she runs. Such a busy lady but still has time to visit and talk with everybody. Yes that is me with Mary Jane. She was so wonderful about taking pictures. The fabric you see is all part of her new line of fabric and it is wonderful. The whole inside of the camper is decorated with it. This is so nice they even added a BBQ grille so it looks like she is cooking . 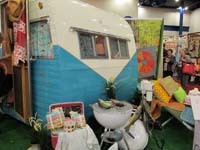 I would have loved to go to market just to see Mary Jane's camper. so fun. thanks for stopping by my blog to see my flying geese row.